Ever heard of drumstick? No, no, not the Chicken drumstick. 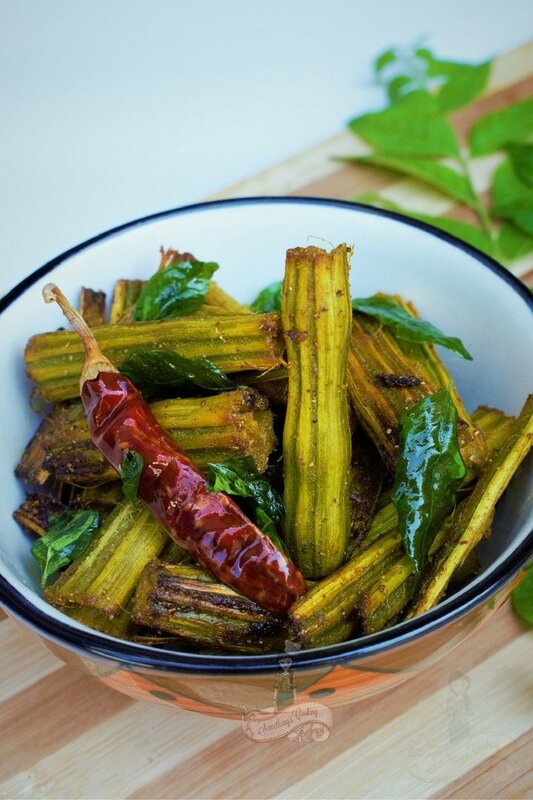 This is a vegetable which provides numerous health benefits and is common in the Southern parts of India. 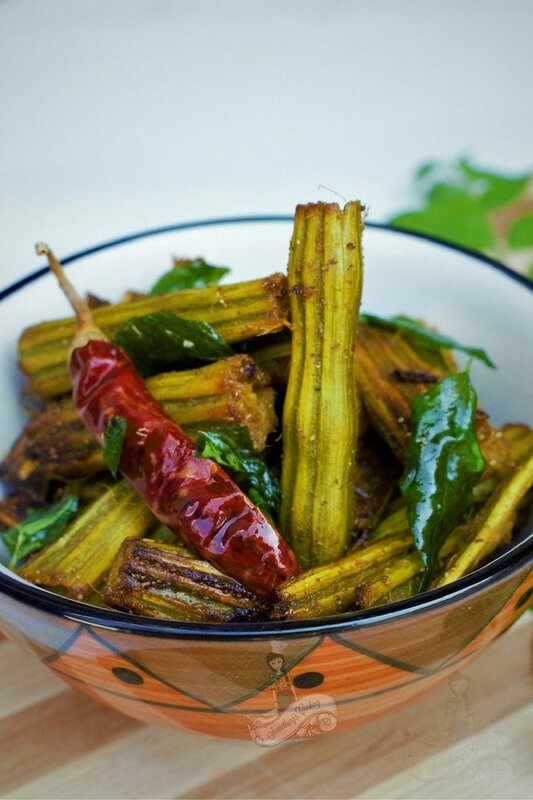 In Kerala, we add drumsticks to Sambar, and also while preparing Theeyal, a curry made with roasted coconut and spices. Drumsticks or Moringa pods are long, slim and green in color. Its leaves are also edible and nutritious. Drumsticks are high in Vitamin C and calcium and are good for bones. It is given regularly to pregnant women and lactating mothers as well. Drumsticks are ubiquitous in South India and both, husband and I were missing it in our Sambar. When my parents visited us earlier this month, this was what they bought – a huge bunch of drumsticks. Do not laugh your heart out! But that’s how much we missed this slender, humble looking vegetable. However, what else can you make with drumsticks? Mamma came up with this easy, yet delicious recipe. Drumsticks are also used in Onam Sadya recipes like Avial. The outer skin is removed and the pods are cut into small pieces. You can split/slit each of these pieces into two or may also leave it as it is. We love to chew it, extract the pulp and discard the fibrous parts. 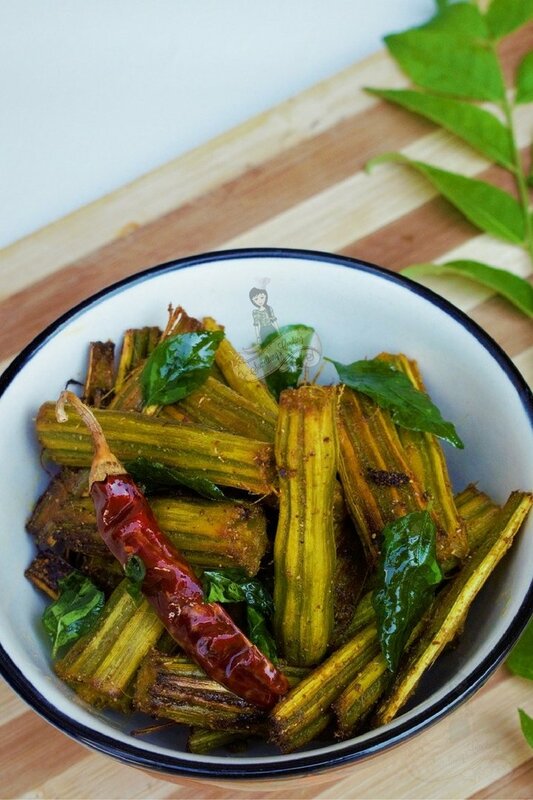 It is flavorful and this dish is an excellent side dish to Rasam and rice. Peel and cut the drumsticks in finger-length size. Cook in one cup of water, chili powder, turmeric powder and salt for about 15 minutes. Heat oil in a pan and add dry red chillies. Add curry leaves and coriander powder. Mix well. Add cooked drumsticks and mix. Saute for a couple of minutes, until almost fried. Do you love drumsticks? Apart from adding to Sambar, what else do you cook with this vegetable? Share your tips. Oh this is easy. I’ve never figured out how to cook drumsticks. My grand mom used to make some kind of a curry. 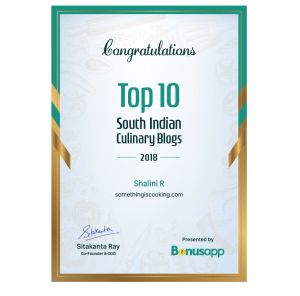 I’ve only had them in sambhar and I love to pick them out and have the pulp. Yummy…i do love murugakai especially this goes so well with rasam. My mom makes yummy soup with the leaves..
Ohh I love drumsticks, my mom used to make it with Dal. never had a fried one though. Looks amazing. I love drumstick!!! I like it the best in a sambhar though. I make a different type of drumstick fry. I use the same spices you have used, but in the end I add in coarsely ground rice and mix it with the spices. This adds a nice texture to it. What! You can make this with just drumsticks? I never knew! Okay, I’m a traitor of my mallu genes! Might save this recipe for a day when I run out of vegetables and need something interesting to cook. We make drumstick curry in Andhra with onions and tomatoes and ofcourse our sambar has drumstick as a compulsory vegetable. But, never heard of drumstick fry. Will try this. Thanks for the recipe. My husband loves it. I normally put it in dal or sometimes in a curry like dish I make. 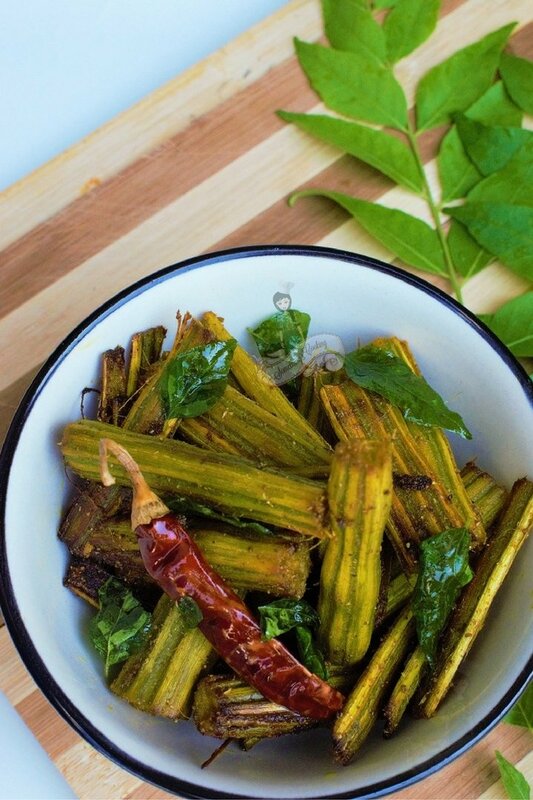 My mil makes a fry with drumstick leaves. She has a drumstick tree at home. Thank you for this recipe. Looks simple enough. Never made drumstick fry but I love the vegetable. It’s a staple in our sambar and the leaves are excellent in the rice adai dish I make. It’s supposed to be one of the most nutritious vegetables ever. This looks very tasty!